Chicago artist Marla Friedman's recent portrait sculpture of the legendary Apollo 13 astronaut Captain James A. Lovell, Jr. follows the historic and time-honored realist tradition. She has had the unique honor to work with the American icon and space pioneer on a number of portraits, both in painting and sculpture, and her portraits of Captain Lovell are in the permanent collection of the Naval Academy Museum, the Abraham Lincoln Presidential Library and Museum and the Captain James A. Lovell Federal Health Care Center. 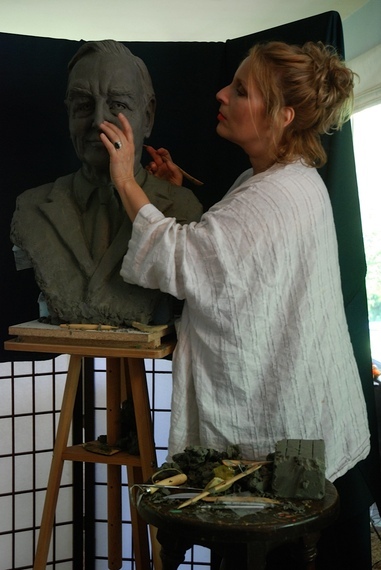 Artist Marla Friedman sculpting clay bust in her Wilmette, Illinois studio, 2010. "Collaborating with Captain Lovell was a history lesson that has been endlessly inspiring," Friedman recalled when I spoke to her about their artistic partnership. "His youthful optimism was a constant, and I could readily see how that particular quality was absolutely key to bringing Apollo 13 home. 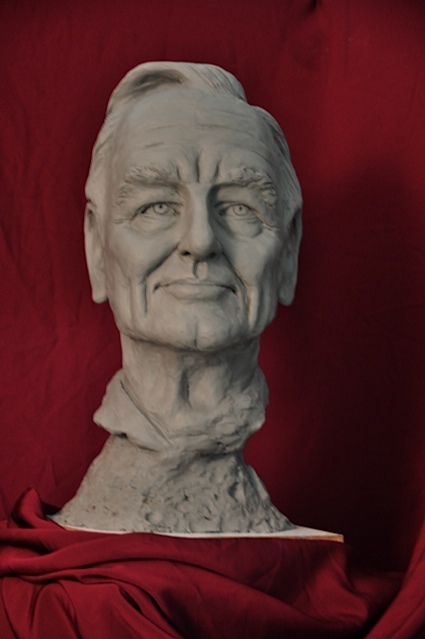 Our objective for the most recent portrait bust was to combine Captain Lovell's ages: as he is today at 85 years young and while in his forties at the time of the Apollo missions. I wanted to capture his enthusiasm and optimism, but also his intense leadership qualities." 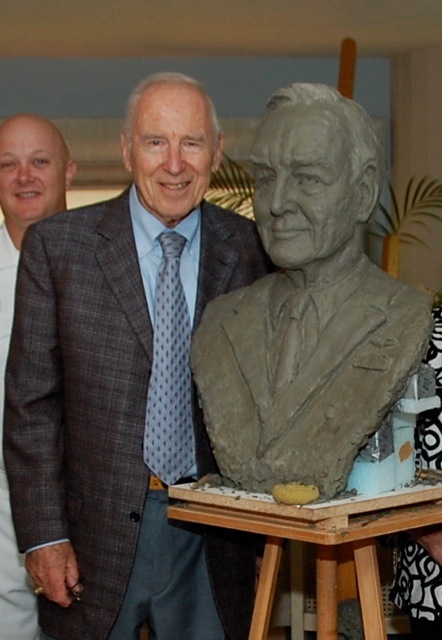 Captain James A. Lovell with sculpture bust by artist Marla Friedman, 2010. Photo courtesy of Hollis Taggart Galleries. 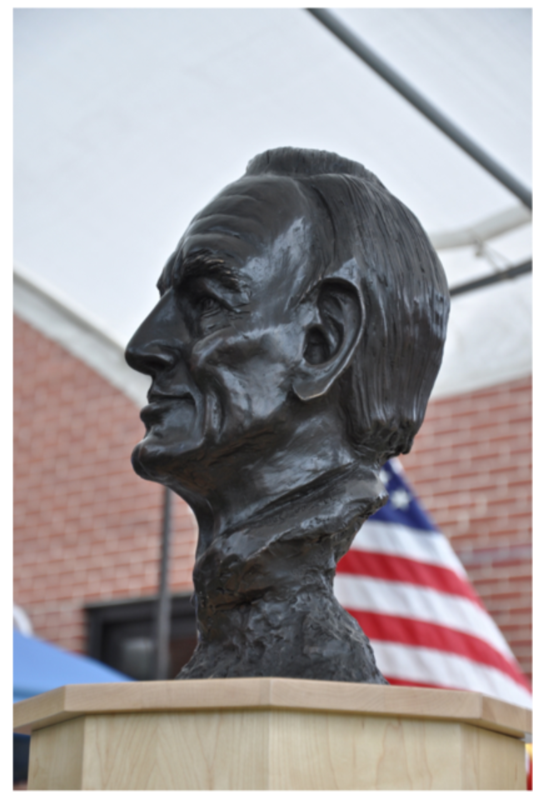 During my interview with Captain Lovell, I discovered those positive, distinctive personality characteristics that seem to manifest themselves in Friedman's sculpted depiction of the astronaut cast in bronze. With the extraordinary career of this American icon, from test pilot, the Naval Academy, Harvard Business School and NASA to becoming the first man to journey twice to the moon to numerous honorary doctorates and the Presidential Medal of Freedom among so many honors, I thought about what the dynamics must have been between the artist and her world-renowned subject. Captain Lovell gave me an unexpected inside perspective over the phone, full of clever observations and genuine compliments on the experience of sitting for a portrait with Friedman. "Considering a sculptured image of your physical profile initially formed from a lump of clay into an accurate, lifelike portrayal is a completely unfamiliar, albeit enjoyable, experience," Lovell said. "She's at the top of her game." 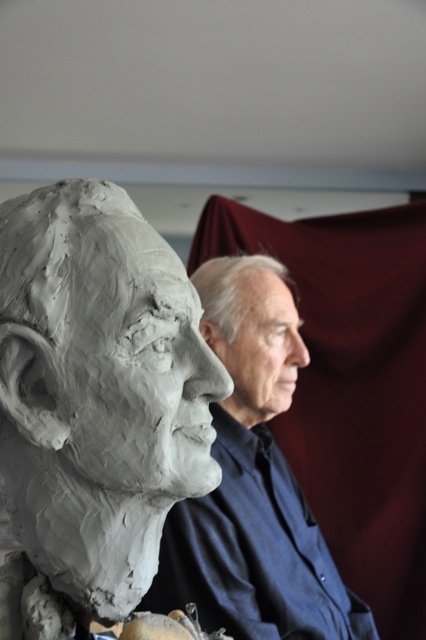 Captain James A. Lovell, sculpture portrait sitting with artist Marla Friedman, 2012. Photo courtesy of Hollis Taggart Galleries. To date Friedman's commissioned portraits include Archbishop Desmond Tutu, a Nobel Peace Prize recipient; former United States Supreme Court Justice Sandra Day O'Connor; former Solidarity leader Lech Walesa, also a Nobel Peace Prize recipient and the former president of Poland; and corporate civic leader Alex Manoogian. Academically trained in painting and drawing at the Art Students League in New York, the National Academy of Design and L'Ecole Albert Defois in the Loire Valley, France, and having maintained her painting studio in the historic Carnegie Hall Studios, Friedman has been dedicated to cultivating her art based on the principles founded in the Beaux Arts. It was in Paris at the Musée d'Orsay where she recognized her greatest affinity in the work of the late 19th century academic master portraitist Léon Bonnat, specifically his 1890 oil portrait of the president of France, Jules Grévy. "I remember coming upon Bonnat's masterful portrait and being transfixed with the nuances of pastel-like brushwork--the subtlety and power of a single speck of Prussian blue," Friedman recalls. "It forever changed my concept of portraiture to a new level and realm of possibility." Self-taught in sculpture, Friedman similarly was inspired by the sculpture portraiture of Jo Davidson. With no preconceived notions of what may be 'right' or 'wrong' in sculpting, having never taken a class, she immediately felt at liberty to express herself with the same kind of freedom so apparent in Davidson's sculptural interpretations. Using no measuring tools, as Davidson impressed, Friedman simply sets up her clay and begins. It was with this freedom that the artist began her first sculpture in 2010--that of Apollo 13 astronaut Captain James Lovell. Captain James A. Lovell completed clay portrait sculpture by artist Marla Friedman, 2013. Photo courtesy of Hollis Taggart Galleries. Life is interesting in the way the circle often completes itself. Raised on the south side of Chicago in the Hyde Park neighborhood known for the University of Chicago and its unique blend of scholarly sensibilities and classical architecture, Friedman discovered that among her chief early influences was the majestic Museum of Science and Industry--literally her playground while she grew up across the street from the late nineteenth century architectural masterpiece. Years later, Friedman would learn that it was the former Palace of Fine Arts of the 1893 Columbian Exposition; the crown jewel of the White City that exhibited the realist tradition of painting and sculpture to which she would later naturally gravitate. It did occur to me during research that oddly enough, Ms. Friedman shares some serendipitous parallels with other artists working many moons before her, who although anonymous, also captured the essence of men in flight literally thousands of years ago, as ancient ships from space presumably hovered above or landed briefly on Earth; there are indeed tangible clues pointing to the creation of the very first astronaut-like portraits carved in stone. Our fascination with the moon is as old as man. Captain James Lovell, being the first to orbit the moon and now immortalized in sculpture, with his signature carved into the clay to create an historic document, is as timeless as the curious images depicted on the cave walls of Pompeii and in ancient Egyptian frescoes. 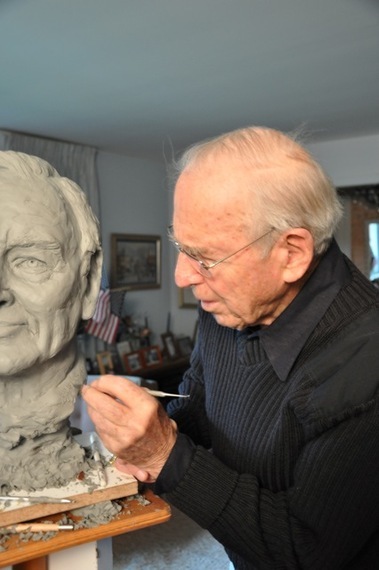 Captain James A. Lovell carving name into clay bust by artist Marla Friedman, 2013. Photo courtesy of Hollis Taggart Galleries. Marla Friedman has been in her own self-propelled, accelerated orbit as an artist finding articulation in the finest nuance of portraiture. "I am most interested in capturing the subtleties of expression. This is true also of still-life paintings. For me, it is the golden moment of that one gesture in clay or single brushstroke that hits the 'note'.... and it is euphoric." 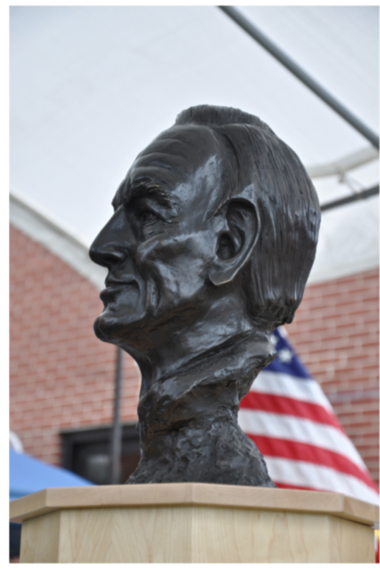 Bronze portrait sculpture of Captain James A. Lovell at the Captain James A. Lovell Federal Health Care Center unveiling, 2013. Photo courtesy of Hollis Taggart Galleries. Now represented exclusively by Hollis Taggart Galleries in New York City, one of the world's most highly esteemed contemporary fine art galleries, for her portraiture in both painting and sculpture, Friedman's platform to grow exponentially is in place. With the genuine success of an artist reaching the pinnacle of her profession, Friedman enjoys the "quiet confidence" of working with an extraordinary art dealer in Hollis Taggart. She noted the similar qualities recognizable in both Captain Lovell and Hollis Taggart: "An expansive world view and optimism that is 'over the moon.'" For more information visit: www.hollistaggart.com.